Through the Public Protection Classification Program, the Insurance Service Office (ISO) evaluates fire departments and their fire protection efforts and capabilities in their communities throughout the United States. A community’s protection rating is based 25 percent on its communication system, 25 percent on its water supply capabilities and 50 percent on the fire department’s capabilities and training levels. 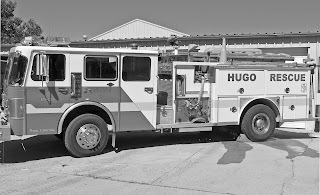 This past August, the Town of Hugo and the Hugo Volunteer Fire Department went through an ISO inspection and we are extremely pleased to announce that we lowered our rating to a 4/4Y. Our past rating was a 7/9. This means that in town within 1,000 feet of a fire hydrant your rating is now a 4. Any home or business within 5 road miles of the fire station is now a 4Y. This puts Hugo in the top 25 percent of communities in the United States for fire protection ratings. The lowering of these ratings will mean lowering of home and business owners insurance premiums within the affected areas. These ratings could potentially mean a savings of hundreds of dollars per year per owner depending on your specific insurance plan. The new rates will go into effect February 1, 2017. We strongly encourage everybody that could benefit from this to contact your insurance carrier to see what this will do for you. This was accomplished in part with the upgrading of the fire department’s apparatus. Over the past five years, the department has been upgrading its fire trucks and equipment through donations from other fire departments within the state to improve its fleet and its capabilities. The volunteers have also spent countless hours training to handle structure fires every year. We cannot thank the community enough for the overwhelming support we receive from you every year. Without you and your generosity we could not have accomplished any of this and we will continue to work tirelessly to protect and serve our community.